Thirty-third Edition, Northampton, Mass. Bridgman & Shields, 1862. This copy had two authors. William D. Morton used it in the way it was intended. He died, however, and his widow Elizabeth proceeded to fill its empty pages with extracts from inspirational and comforting poetry, spiritual and other material (Carlyle, Emerson, Humboldt, Lucy Larcom, et al) while awaiting God’s call to rejoin her husband. This volume is almost entirely filled in, by index entries, extracts and, in five or six preliminary and endmatter pages, pasted autographs, quotations, carefully scissored postmarks and a newspaper clipping regarding the trials of widowhood. Shown above, inside front cover, first flyleaf. Among the autographs are two by Carrie E. Morton (a daughter? 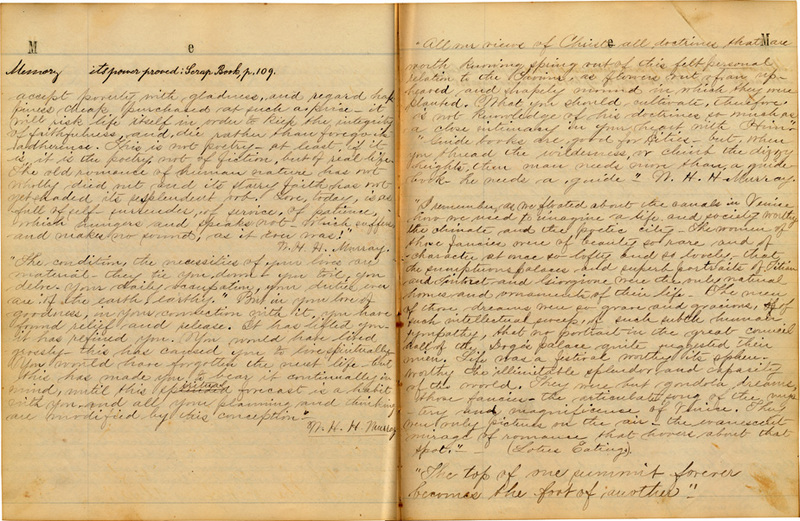 ), one indicating her women’s fraternity, the other, in enfeebled handwriting, dated March 10, 1875, Chester, Conn. 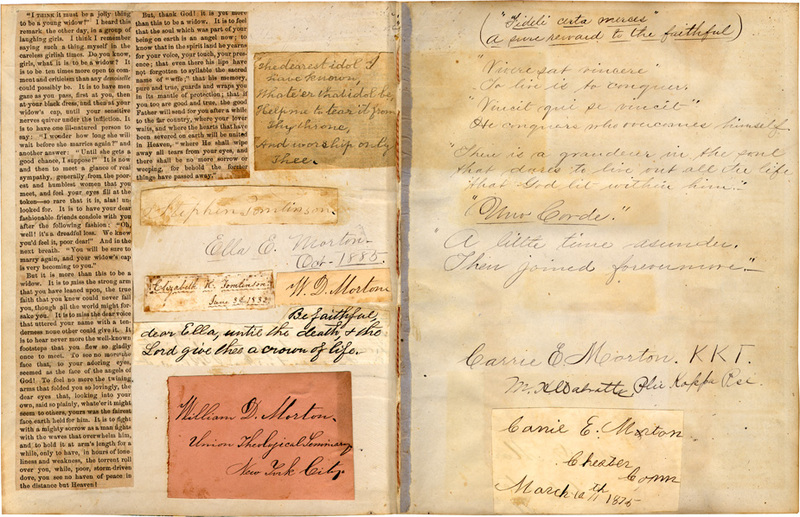 In these front and end pages are pasted autographs, quotations, carefully scissored postmarks and a newspaper clipping regarding the trials of widowhood. Not readily visible here is evidence that two or three lines of (autograph?) 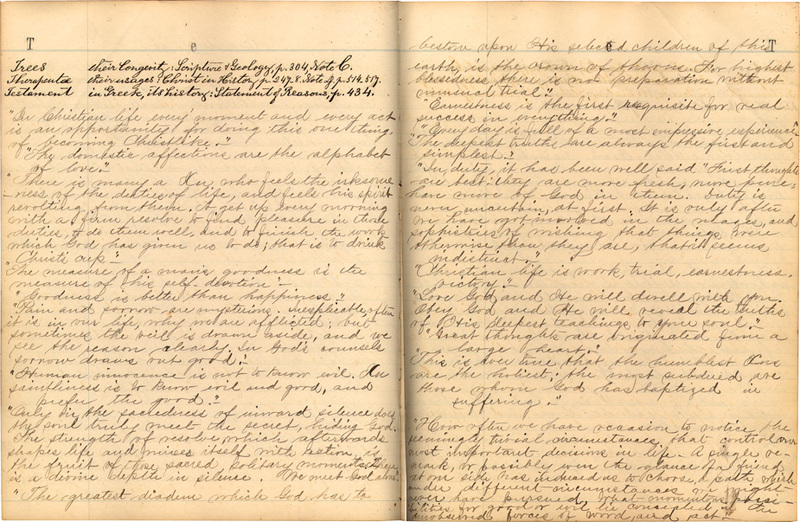 handwriting have been energetically erased/scoured from these two pages. This volume is almost entirely filled in by index entries and extracts. Aratus; Aged; Battles, Baptism, Banking, Baptism, Baptisteries, Baptism, Baptists; Bible, Blind; Burr; Creed; Christ, Christianity, City, Child; Congregationalists, Cotton (gin, its inventor : Scrap Book, p. 39, its history, p. 40-41), College, Constitution, Columbus, Congregationalism, Conscience; Church, Currency; Deluge, Deacons, Dead; Diognetus, Divorces; Doddridge; Drunkeness; Earthquake (at Riobamba, In Peru); Essenes; Epicureanism; Flag; Fire (how extinguished; Cuba with Pen & Pencil, p. 151); Flood, its tradition wide-spread: Christ in History, p. 128; Galileo; Geology, Gehenna; Globe; Hume; Infallibility; Inventions; Immortality; Indulgences; Jerusalem, Jesuits; Joshua, Job, John 15;7; 1 John 5;7; Justin, Jus; Knowledge (its desire natural to mankind: Facts for Boys, p. 39); Life; Logos, Loretto; Mariolatry; Memory (its power proved, Scrap Book p. 109); Mines, Miracles; Mountains, Moravians, Money; Niagara; Prayer, Pharisees; Pelagius; Pilgrim; Population, Pope, Poets; Queens; Religion, Rebellions, Rebaptism; Rosetta, Roman, Romanism, Rome; Sadducees, Synagogue; Semi-Pelagians; Sin, Singing; Sovereigns, Socrates, Stoicism; Surnames (when first used), Sublimity, Superstition, Sunday Schools (origin & influence of); Tracts (when written & circulated; Scrap Book, p. 135); Trees, Theraputae, Testament; Trinity, 1 Timothy 3:16; Volcanoes; Wonders (in America: Scrap Book, p. 104); additional pages : Baptism; Congl. Polity; Revival; Crashaw. Morton’s entries are few enough, that I will endeavor to list all of them, in part so that I might better address the contribution of Ella whose extracts form the bulk of this copy. It is unclear whether Scrap Book referred to in many entries (a couple of them listed above) was a contemporary periodical, or a separate scrapbook maintained by Morton. If the latter, this Index Rerum serves as an index to that scrapbook, in addition to other sources. William H. H. Murray, author of Park-Street Pulpit: Sermons Preached by William H. H. Murray (Boston, 1871) here. George MacDonald. All the doors that lead inward to the secret place of the most High are doors outward — out of self, out of smallness, out of wrong. Included in Selections from the Writings of George Macdonald or Helps for Weary Souls, compiled by J. Dewey. (Chicago 1889) here.